Zahara Assad has wanted to be a doctor for as long as she can remember, trying several times to get into medical school in the UK. Needing to juggle studies with bringing up three young children, she was accepted for an interview to study medicine in London - but that's as far as she got. "There were no grade issues with me," she tells us. "I had the required grades. When they looked at my personal statement they just said, 'Oh, you're a mother'. "I'm sorry to say the British system had a very narrow perception of what I was capable of." Zahara says it was her commitment to last the distance in medicine that was questioned in the UK. Disappointed but determined to cling to her dream, she decided to turn her sights abroad, to Bulgaria. Now she is in her third year and has four children back in Barking who are looked after by her husband and parents who give her "amazing support" to fulfil her dream. Zahara is not alone. She is one of a growing number of British students now studying in Eastern Europe. The Medical University of Varna has 250 more like her, studying medicine and dentistry. In this holiday resort on the Black Sea, the slightly cheaper tuition fees at 8,000 euros a year, and substantially cheaper living costs, have made coming here an attractive proposition. At Varna's St Marina University hospital we are shown, with pride, around several departments. The building needs a lick of paint outside, but inside the wards are spotlessly clean. We meet second-year medics hoping to specialise in neurosurgery. Shahswar Arif, from Hounslow, and Zarina Brady, from Dublin, are deep in discussion with their tutor about a patient with a brain tumour. Their professor, Yavor Enchev, is the head of neurosurgery and a member of the Fellowship of the Royal College of Surgeons in the UK. Both students came after initially taking a degree in the UK in a different subject. Neither was successful with their medical school applications in the UK because of the fierce competition for the limited places. So do they feel let down? "No, I can understand that the standard has to be high to get into medicine," Shahswar says. "But now 18-year-olds are competing with PhD students, and even several A*s are not enough to get into medical school in the UK." 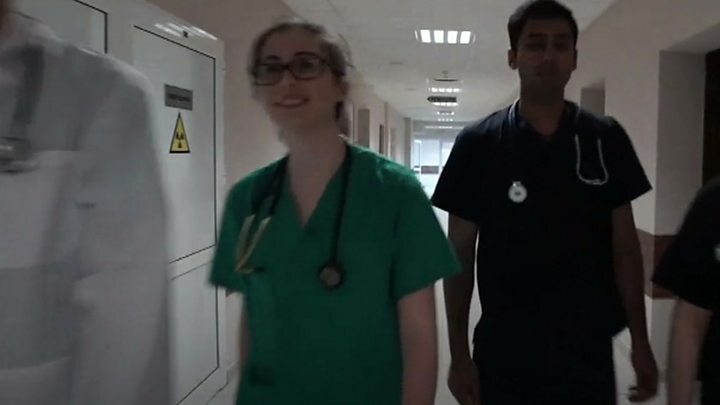 Zarina says she hasn't struggled with the hard work expected of them, but having to learn to speak Bulgarian to treat patients is more of a challenge. Varna's vice-rector of student affairs, Prof Albena Kerekovska, says There has been a big increase in the number of UK students coming to study medicine in the last 10 years because they offer their courses in English and the standard of education is high. But what about the concerns that her British students come here because their A-levels are not good enough to get them into medical universities at home? "The young people we get are highly motivated. We have an admissions procedure regulated by the state and all applicants have to sit and pass entry tests in biology and chemistry to study here," she tells us. Varna's medical school is far from the only place attracting British students. We've discovered that there are dozens of English-language universities all over Central and Eastern Europe trying to attract British medics - and not all of them have admissions tests. Romania, Hungary, Poland and the Czech Republic are among the destinations for substantial numbers of students over the last few years. Agencies have also sprung up to encourage this migration. Many charge thousands of pounds to help settle students. Aris Grigoriou, head of student recruitment at Study Medicine Europe, says his agency sent 1,500 students from the UK and Ireland to Bulgaria and Romania last year alone - and the numbers are expected to grow, thanks to the cheaper fees overseas and the limited numbers of places available in the UK to do medicine. "All the universities have to meet EU standards. Many of the students have A and B grades. Some universities are more flexible and accept lower grades, like Cs, but those students have to do extra entrance exams in biology and chemistry," he says. The agency charges to help students with accommodation and offers translation services. Mr Grigoriou says the level of training means their qualifications will be regarded as equal to those of their British-trained colleagues. But will all the trained medics returning to the UK find work in the NHS despite the shortages of doctors - and does it matter that they are being trained abroad? The General Medical Council, which sets the standards for medical students' education and registers all newly trained UK doctors, told us that current EU legislation embedded in UK law meant doctors who qualified in Europe could not be asked to sit clinical exams to check their competence. However, things might change with Brexit. Chief executive Charlie Massey admits there is a weakness in the system. "For some years now we have argued that we should have the right to test the competence of European doctors with assessments of their knowledge and clinical skills, just as we do for doctors with international medical qualifications. "Brexit provides an opportunity to improve the checks we can carry out to ensure all doctors practising in the UK meet the same standards." For now Shahswar and Zarina are focusing on finishing their training. "We know how lucky we are to have this chance to become doctors. Ultimately we'll be coming home to work in the NHS." What exactly do junior doctors do?